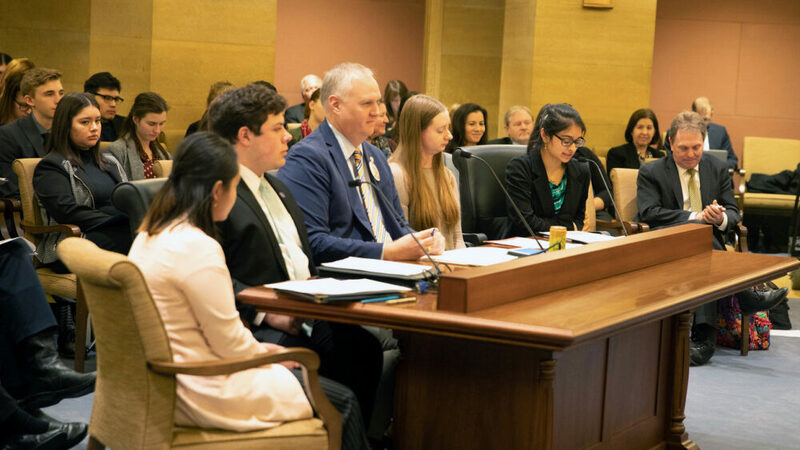 Junior Monali Bhakta testifies alongside fellow students from Minnesota private colleges and Sen. Paul Anderson (44) in support of the Minnesota State Grant. 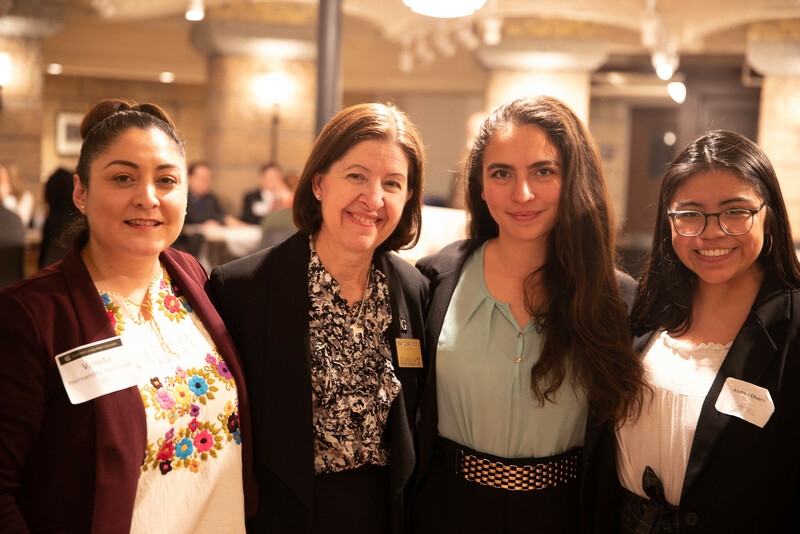 On Tuesday, March 12, a group from Gustavus Adolphus College descended on the Minnesota State Capitol for a day of advocacy and networking. 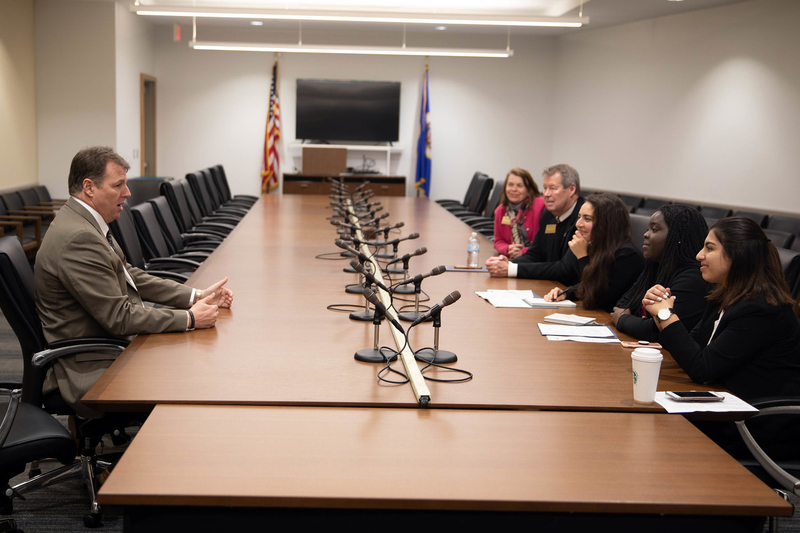 Consisting of nearly 40 Gustavus students along with a team of administrators including President Rebecca Bergman, the group was in St. Paul to meet with legislators to discuss the Minnesota State Grant program. After an update on the 2019 legislative session and quick training on the logistics of meeting with legislators and navigating the Capitol complex, each student set off with an individual schedule of appointments with their senators and representatives. The main objective? To advocate for the Minnesota State Grant, a program that connects more than 80,000 state residents—approximately one in four undergraduate students—with need-based financial aid that recipients can use to help attend the college or university of their choice. At Gustavus, over 35 percent of students receive funding through the program. Saint Peter area Sen. Nick Frentz meets with students and staff. “It was interesting to talk to my senator and representative because they were personable and willing to listen to our stories,” said junior political science and English major Monali Bhakta, who also joined students from the University of St. Thomas, St. Catherine University, and Bethel University to testify in support of the state grant program in front of the Minnesota Senate Higher Education Finance and Policy Committee. While students met with legislators from their home districts, President Bergman caught up with Gustavus alumni legislators including Rep. Paul Torkelson ’74 (16B), Rep. Nels Pierson ’95 (26B), Rep. Kristin Bahner ’95 (34B), and had lunch with Saint Peter Rep. Jeff Brand (19A). 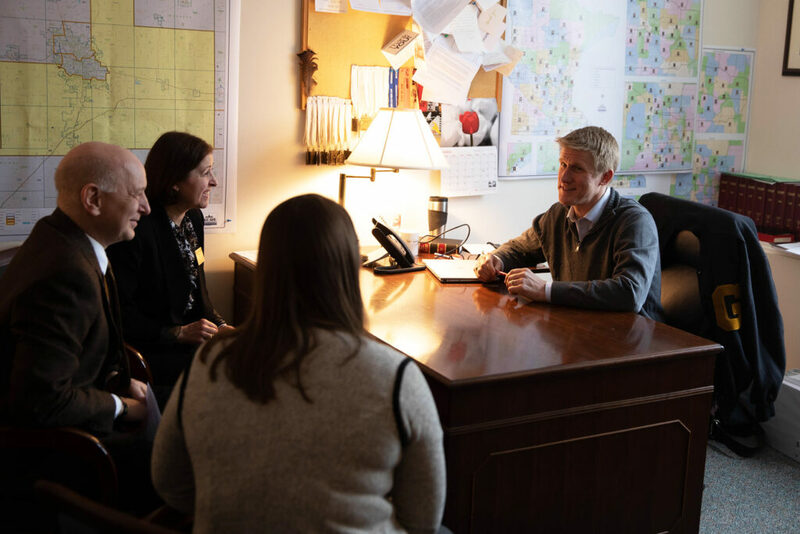 Rep. Nels Pierson ’95 meets with President Rebecca Bergman, Vice President Tim Kennedy, and Assistant Director of Alumni and Parent Engagement Marissa Haeny. Many of the students who attended Day at the Capitol are currently enrolled in political science professor Kate Knutson’s U.S. Public Policy course, which looks at the process of policymaking and the effects of public policy in America with a particular focus on education, social services, immigration, and health care. 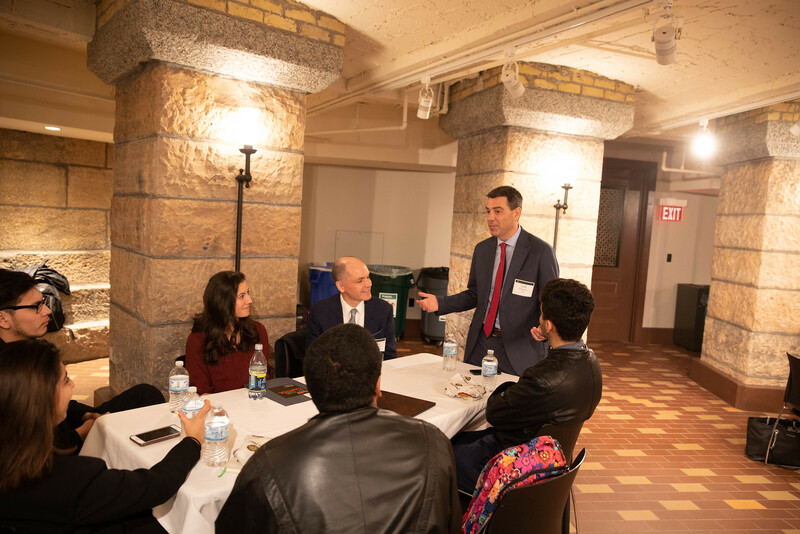 For students in the course, the visit to St. Paul brought to life the processes and procedures that they study in class—including the frenetic pace of life at the Capitol during a crucial deadline week for bills in committee. Some of the students’ scheduled appointments with legislators took place on the fly, evolving into walk-and-talk advocacy between lawmakers’ meetings or in the hall outside committee hearings. Following Bhakta’s testimony in the Senate committee meeting, the group debriefed about their meetings with legislators before heading to the basement of the Capitol building for a networking event with Gustavus alumni. There, the students were joined by over 30 graduates who work in legislative affairs, advocacy, law, and public service. 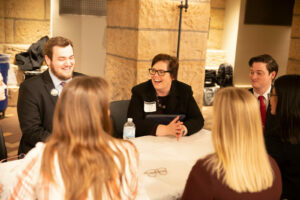 With alumni representing class years ranging from 1974 to 2018 and jobs ranging from commissioner of a state department to representative to lobbyist to scheduler for Lieutenant Governor Peggy Flanagan, there were plenty of opportunities to ask questions about life in government and learn about the various Gustie journeys. As for Bhakta, she considers the networking connections to be the most rewarding part of a busy and successful day. Commissioner of the Minnesota Department of Transportation Margaret Anderson Kelliher ’90 laughs with students and fellow alumni. Met Council Government Affairs Director Judd Schetnan ’94 introduces himself at the networking event. Violeta Hernandez Espinosa ’07, President Bergman, Maripaz Alvarez ’19, and Andrea Olvera ’22 at the networking event.